It has been a few years since I was first introduced to the Cultural Series being put out by Carole P. Roman. The books were fun and quick, and I really enjoyed using them with my children. Since that time, the Crew has been blessed to work with Carole a few more times, and she has expanded her offerings to include a few more types of books. My favorites are still the If You Were Me and Lived in... titles though. The Cultural Series is intended for younger children than mine, as Carole suggests it for ages 4-9. Trina has been working on her Ancestor Detector badge for American Heritage Girls, and one thing they are required to do for this badge at her level is to learn about the native country of your relatives, doing a number of things such as learning about native dress, foods, traditions, etc. There are a couple dozen books in this series at this point, so we couldn't find a book for all of the native countries of my ancestors. However, we were able to cover a few. I'm going to talk about a few different aspects as I cover the four books we used, but know that if I tell you that they discuss the kind of money used in one of the books, that also applies to the others. If You Were Me and Lived in... Germany is a great one for us. She has German heritage on both sides of the family. These books are all set up basically the same way. You are introduced to a child from the country, and some of the things in his (the child in the Germany book is a boy) life. So you see a map of the country and learn that Germany is in northeastern Europe. You learn that Berlin is the capitol, and that 1/3 of it is natural areas - parks, lakes, etc. I told her about how amazing it was to visit Berlin some thirty years ago, as we immediately felt right at home with all of the lakes (I lived in Minnesota at the time). If You Were Me and Lived in... France is the one she was most excited about. The earliest of her ancestors to immigrate to the New World came from France to Canada in the mid 1600s. The food aspect of the France book stood out to Trina. 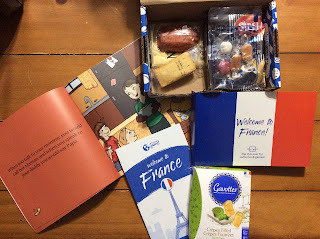 We subscribe to Universal Yums, which sends a box of snacks from various countries. For her birthday last month, Trina got a box from France, which I presented with this book. Every time the book mentioned food, Trina pulled out her box to see if they had sometime that related. Trina was thrilled to try some of what she was reading about. I found it interesting that the France book (and Norway too) had much larger print, and far fewer words than the Germany book. If You Were Me and Lived in... Poland was the one I was most excited to receive. Back when the Iron Curtain was beginning to have some holes, I spent two weeks in Europe. My roommate and I went to Germany and to Poland. The book throws in a lot of language for the countries being studied, including pronunciation helps. In reading through the book, you cover words for family members (mom, dad, grandma, grandpa) and food, plus words for place names. You learn about some important people or events, such as Chopin and Copernicus, and why there are so many mermaid statues in Warsaw. If You Were Me and Lived in... Norway is the final book we can use for these studies, and that means she can learn about all of the major countries on her dad's side. In reading through the book, you learn some common boys and girls names, like Magnus and Birgitte. You learn about popular activities and places to visit. You also learn about holidays, such as Syttend Mai, the celebration of Norway's independence. I do think these are a fabulous introduction to various countries, and for older students, it is a great jumping-off point. You could go on to learn the background behind Dzien Dziecka (Children's Day), or you could research Gustave Eiffel. You could listen to some of the foreign words used in the book, or try to recreate the meal that is described. The book itself might be totally appropriate for those 4-9 year olds, but there are so many tantalizing little hints of bigger things that I think it is perfect for older kids as well. Now, if Carole would just get working on a book for Sweden, Wales, and Lithuania, we could polish off my side of the family too! Go see what the Crew had to say about Carole's many different books. Another series I really enjoy is her historical titles which are intended for a slightly older audience (ages 8-15) and cover things such as If You Were Me and Lived in... Viking Europe, which seems like a perfect follow-up to learning about Norway. These books are amazing! Love them! thanks for a great review. Loved your review, I am thinking on getting a few of these to go along with the kids language lessons. Carole P. Roman books are the favorites we have of If You type books. I'm so glad to be able to share these with my children. We've got a dozen of these! China has always been a favorite here. When I found out I'm mostly Scandinavian, I picked up the Norway one.